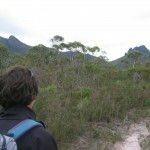 Mt Magog to Mt Talyuberlup at Brett Writes! The track to Mt. Magog was in much better condition this year than in 2007, and instead of wading through prickly bushes, we could admire the wildflowers as we went — the area gets a lot of runoff from the surrounding peaks, so sometimes it can be a real botanical garden as Sue puts it. Mt. Magog has a sort of clearing about three quarters of the way up. Once past that, we were delighted to discover fungi with light blue caps with yellow centres — we later identified as Blue Cortinarius — dotted through the forest there. Sue found a lovely cluster of red-capped fungi we couldn’t identify. At the top of Mt. Magog we enjoyed Apple Strudel, and then made our way back down to the clearing as the first of the rain started blowing in. The journey across the ridge was uneventful and lightened by some spectacular views of the Stirling Ranges. 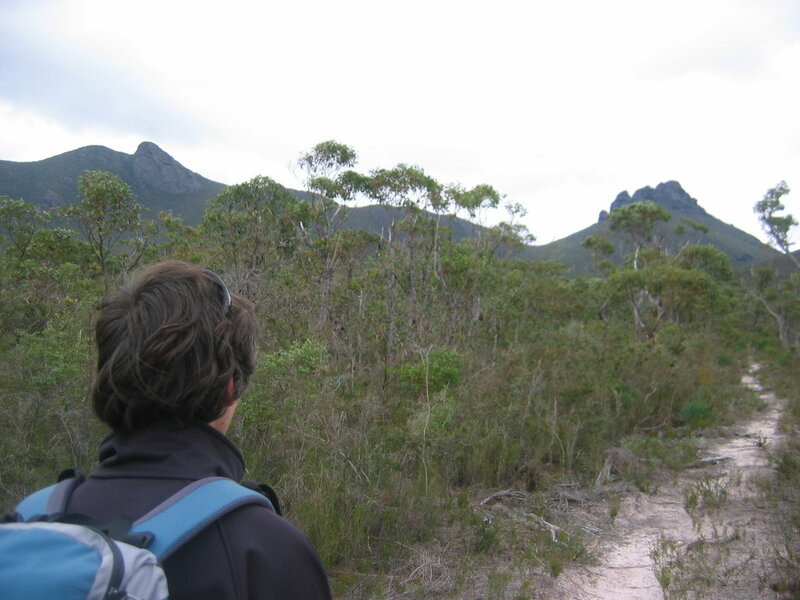 In 2007, after we got off the ridge, we went to the left of Talyuberlup to climb into the peak; and wound up with a lot of hard slog bush-bashing, only to be confronted with some cliffs we didn’t much like the look of. This time we resolved to avoid all that and went around to the right; however, not far enough to the spire! We wound up with several kilometers of bush-bashing through dense prickly scrub with ample prickles … when we got back, our legs looked like we’d waded through a herd of angry cats! Next time we will go right again, but right up to the rocky spire where (apparently) there is an actual track!